There are a few products which I have used recently which I have been really impressed with, and a few brands that I have never tried before that are now firmly on my radar. 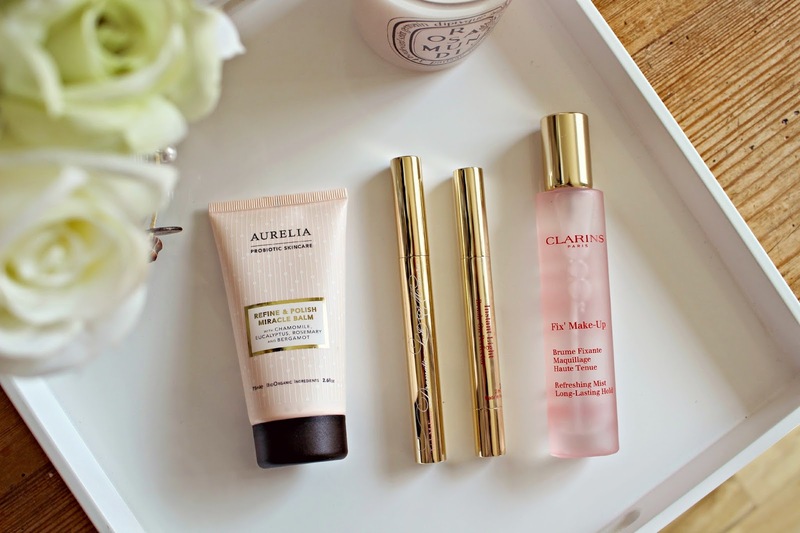 I was introduced to Aurelia at the Liberty Press Breakfast a couple of weeks ago, and was delighted to find their Refine & Polish miracle balm in the goody bag! I also learnt more about Trish McEvoy at the event, a brand which I had heard of but never used before, and I was totally won over by the sound of their Mascara. The other two products which I am loving at the moment are the Clarins Fix Makeup Refreshing Mist and their Instant Light Brush on Perfector. The Instant Light Brush-On Perfector from Clarins is very similar to the famous YSL Touche Eclat, and I would say the differences are actually very minimal. I would say that the Clarins product is slightly more sheer, making it more suitable for highlighting, rather than concealing, and this means that it doesn’t crease like the YSL is prone to do. It is fragrance free, creamy and hydrating which is a major bonus for the delicate under eye area. 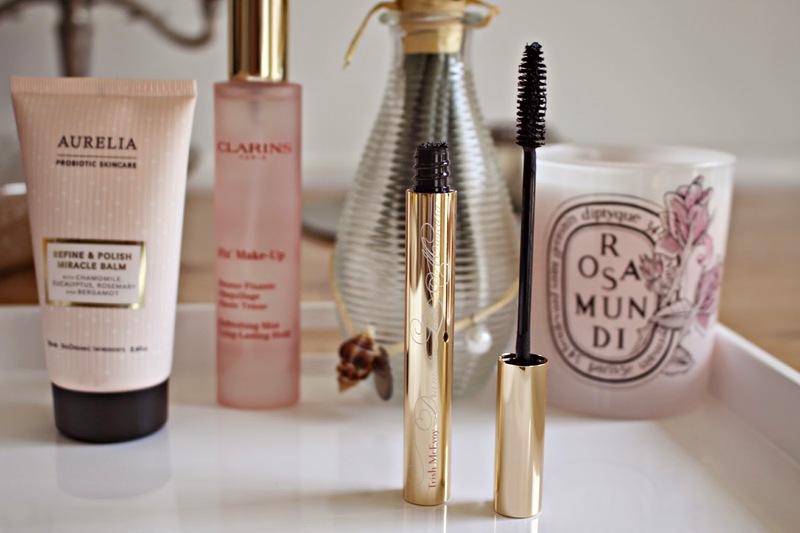 As it feels a little lighter than the YSL Touche Eclat, I am happy to swap my usual favourite for the Clarins product over summer months! After falling in love with the Aurelia brand having met the founders at the Liberty event, I was so excited to find their Refine & Polish Miracle Balm in my goody bag from the event. This multitasking balm can be used as a polish or a mask, and ingredients include exfoliating active fruit enzymes, so as you can image, it smells fabulous and super luxurious! BioOrganic oils within the scrub noticeably brighten the complexion when it’s used as a daily scrub, and there are lots of little beads which work to dislodge dull skin cells from the surface. The product is a super luxurious treat, and with a price tag of £57 you expect it to deliver results, but it sure does just that! The balm transforms into a milky consistency when mixed with water, and leaves my skin feeling silky soft and deeply cleansed. The Clarins Fix Makeup Spray promises to set makeup and prolong hold, while providing a feeling of instant freshness and wellbeing, AND provide continuous hydration and comfort. I put the spray to the test by wearing it before a circuits session at the gym, and while I don’t tend to work out wearing heaps of makeup, the face that I left the house with that morning, as still firmly in place when I arrived back home after work, EVEN after a sweaty gym session! Skin is left extremely glowy when first applied, but these settles and skin feels super hydrated. I will be saving this spray for special occasions when I need my makeup to stay put all day – summer weddings, graduation, parties and the nights when I need my makeup to stay put! Finally, this Trish McEvoy Dramatic Lash Mascara has impressed me in so many ways. Firstly I adore the packaging, it looks so sleek and luxurious, even though I can barely read the writing on it! 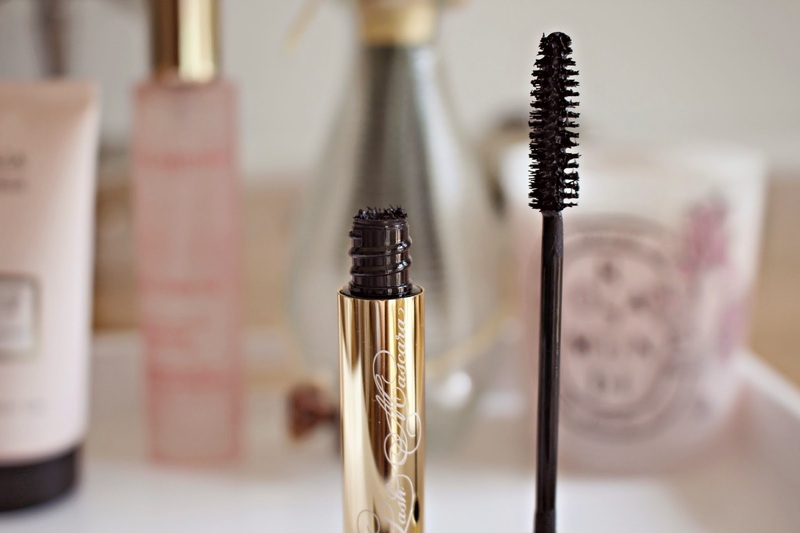 More importantly, just one application of this mascara will make you realise how special it is – delivering full, long lashes, and the formula is conditioning and long lasting. The intensely black pigment is also build able, so you can give your lashes one sweep for a dainty day time look, or build up several coats for bold, evening lashes. What are your favourite beauty treats right now?